"I Spent Midnight with the Thing on Bald Mountain!" A talented sculptor creates his ultimate piece, "Good vs. Evil", in a remote castle in Central Europe. A freak electrical storm sends a bolt of lightning through the avatars of Good and Evil, bringing them to life, and an epic battle ensues. -Story illustrated by Steve Ditko; 5 pages (T-460). -Reprinted from Tales to Astonish (1959) #7. "I Dared Defy the Floating Head!" -Reprinted from Tales to Astonish (1959) #8. "I am the Man Without a Face!" -Reprinted from Strange Tales (Vol. 1) #71. "He Waits for Us in the Glacier!" An atomic sub, traversing the waters of the arctic, tests its device that melts passages through glaciers and inadvertently disturbs the sleep of an ancient alien that communicates to the crew telepathically. The creature has waited to see if humankind will progress forward or ultimately kill each other. -Story illustrated by Don Heck; 5 pages. 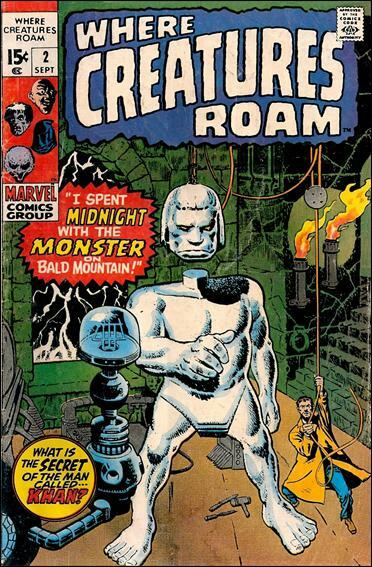 Cover reprinted from Tales to Astonish (1959) #7.